These large mussels from New Zealand are ready-prepared and cooked, saving you time. Serve them in this simple supper dish that takes just 20 minutes. First make the pesto. Place the coriander, garlic, lemon grass and chilli in a food processor or liquidiser and pulse until finely chopped. Add the remaining ingredients for the pesto and blend to a paste. Preheat the grill to hot. Place the mussels open-side up on a grill pan lined with foil, and use a teaspoon to distribute the pesto over each one. Sprinkle with the cheese. Grill for 3-4 minutes until the cheese is golden and just melted and the mussels are thoroughly heated through. 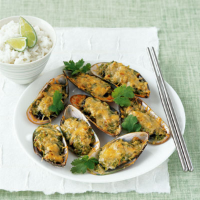 Allow the mussels to cool slightly, then serve with Thai fragrant rice and lime wedges. For an even speedier meal, you could use a ready-made basil pesto instead of making your own.